Storms sent sediment into Dyke Marsh West. Storms gouged out streambanks and sent sediment into Dyke Marsh. 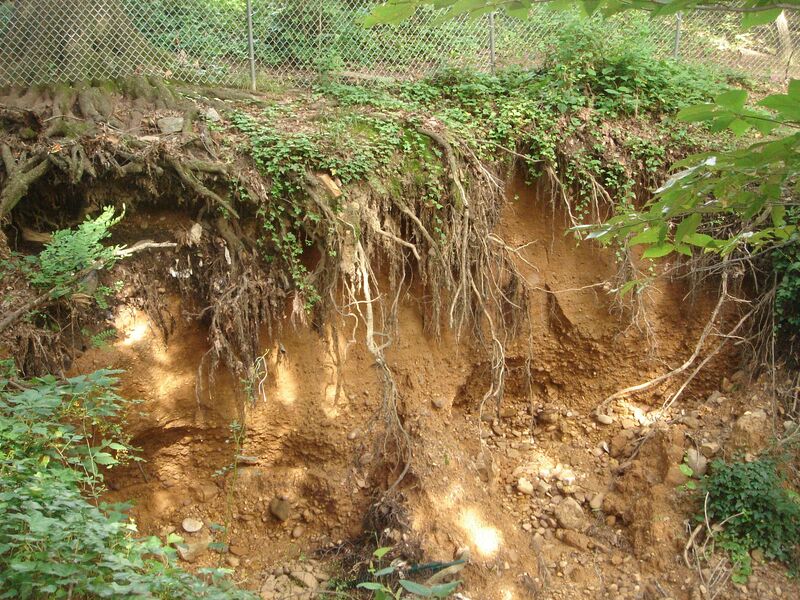 Fairfax County has completed a major project to repair a failing stormwater outfall in Mount Vernon District Park, a massive erosion gully 20 feet deep, over 50 feet wide and 200 feet long that was sending massive volumes of sediment into Dyke Marsh West, the part of the wetland west of the parkway. Concerned FODMers observed the marsh turning orange during storm events. FODM contacted Fairfax County officials in 2014 and urged them to identify the cause and solution. 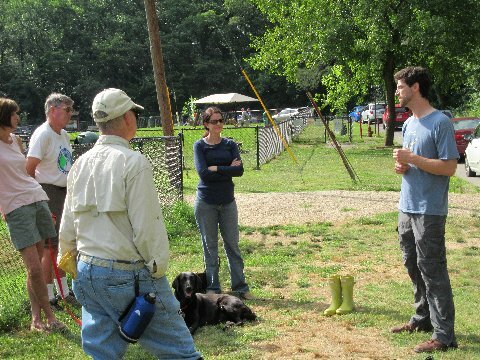 Dan Schwartz of the Northern Virginia Soil and Water Conservation District described water quality testing methods to the group.County officials determined that impervious surfaces upstream, like roads, roofs and parking lots, prevented rain from naturally infiltrating into the ground and that stormwater was uprooting trees, gouging out stream banks and sending sediment downstream. The project attempts to stabilize streambanks and slow the velocity of the runoff. 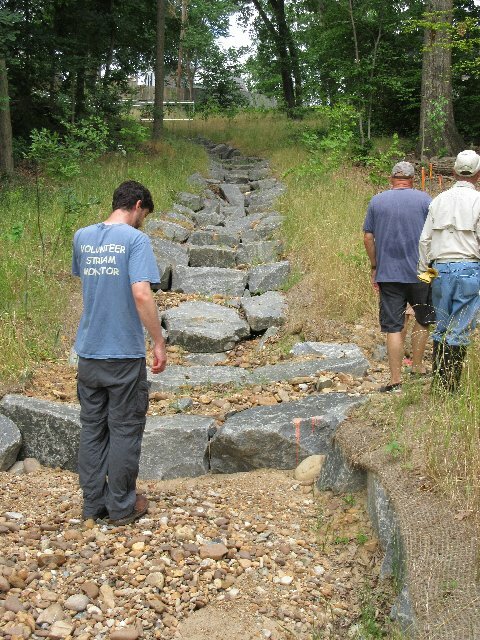 The design includes riprap or large rocks that line the stream and plunge pools that can in effect slow the water’s flow downhill. The county has planted many native trees, grasses and plants to restore the area disturbed by construction. The county’s website describes the project: “A total of 930 feet of outfall channel will be restored to prevent erosion, convey stormwater and elevate the surrounding groundwater table to improve soils and support native vegetation. Surveys were done to ensure that the endangered small whorled pogonia (not found) and archeological sites (none found) would not be impacted by the project. Surveys also determined the condition of the stream channel and soils, and documented the plant species and the condition of the plant communities that are on site. Project managers planted native trees, grasses and other plants.“The project will include construction of three trail crossings of outfall channels and extensive native plantings to stabilize and restore habitat. The 80-acre Mount Vernon District Park represents an undeveloped, high gravel terrace, a piece of remaining coastal plain forest. 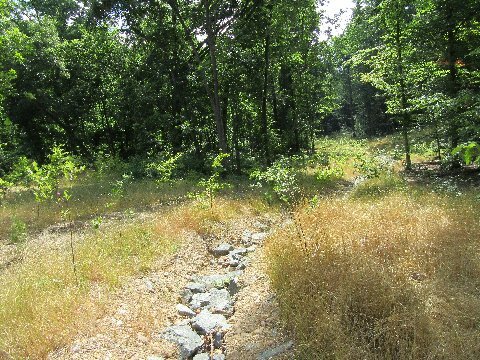 Most of these terraces have been disturbed, destroyed or developed in Fairfax County. 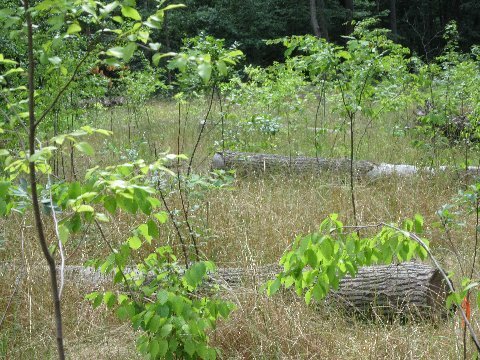 It is “one of the better large forest stands remaining in this part of Fairfax County,” said project manager Charles Smith. The forest of intact ridges has some undisturbed shrub layers, seeps and valuable native plants, like blueberries, deer berries, pinkster azaleas, arrowwood, sassafras, skunk cabbage and sensitive, cinnamon and royal ferns. The county prioritized the project, started construction in August 2016 and completed it in April 2017. Officials will monitor it through 2020. The project’s website is online here. FODMers thank Fairfax County and county taxpayers for this project and hope that it will restore the ecological integrity of the area and stop further degradation of Dyke Marsh. Dan Schwartz of the Northern Virginia Soil and Water Conservation District explained that riprap can slow stormwater velocity. 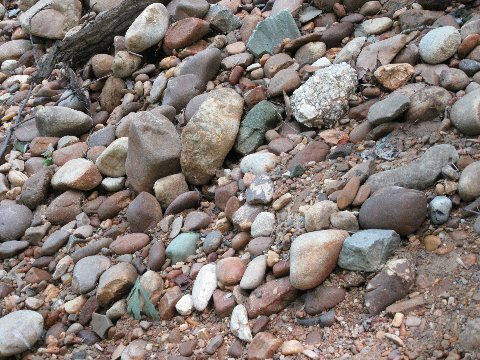 The rounded rocks in the streambed are typical of coastal plain habitats. Logs can also help slow the water’s flow.